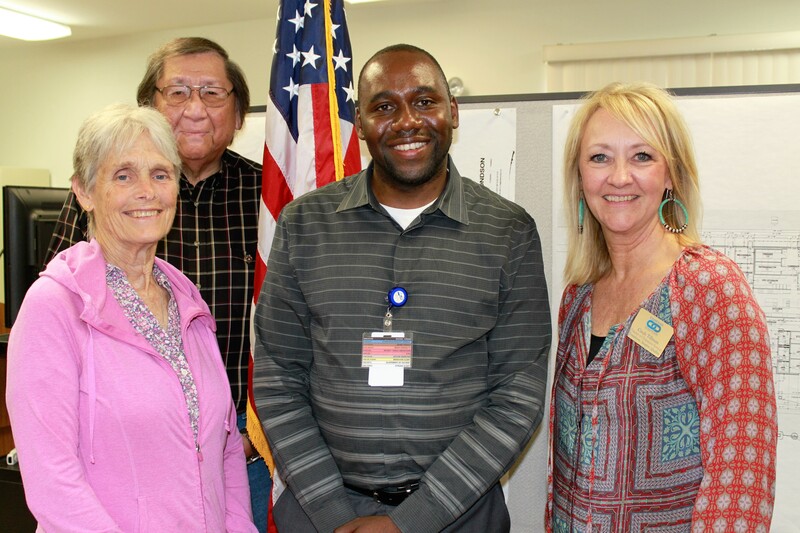 Godwin Fey was the guest speaker at the Pawhuska Rotary Club recently where he spoke about the journey that led him his present position as Pawhuska Hospital’s Administrator. He was asked to speak by Carol Crews, who was Rotarian of the Day. Fey, who hails from the country of Cameroon in the Western part of the African continent, grew up the son of a school principal and the youngest of six children. He connects with rural Oklahoma in part because of his own rural upbringing. “I spent a lot of time with my grandmother on the farm and learned to cook and to farm,” Fey explained. When he was young, he sold oranges grown on the farm, and brought the money home and put some of that toward his tuition. Fey came to the U.S. on an education visa in 2003 to attend Hillsdale Freeway Baptist College in Moore on a soccer scholarship. After two years, he transferred to Oklahoma State University, where he earned an associate’s degree. Thereafter, he began working two jobs as a certified nursing assistant to pay for the balance of his undergraduate education at Oklahoma Panhandle State University, where he earned his bachelor’s degree in nursing. Fey moved to Shawnee, Okla., which he felt represented America. While living in Shawnee, Fey earned his Master’s degree in Business Administration, met and married his wife, and the two began exploring what he described as his “American Dream” to open a business selling uniforms. His wife, who is also a nurse, now runs that business, which continues to grow and prosper. He became a U.S. citizen recently and is very grateful for what the United States offers. “If people were to leave for one year, they would appreciate their citizenship,” Fey told Rotarians. In 2016, Fey accepted a position at Cohesive Healthcare, a management and consulting company based in Edmond, Okla. They placed him in a position at Pawhuska Hospital as the Administrator. Since taking the position as hospital administrator, he’s had to make some tough, yet fair decisions, he said. “The hospital staff is like a family. I’ve never been somewhere that people work together so well. One thing I’m very proud of is the quality of employees we have. We pay competitive wages at Pawhuska Hospital — comparable to what is paid in Tulsa and Oklahoma City,” he added.